Not sure where to begin or what you're getting into? This guide will help to ease you in gently. The very idea of starting a D&D campaign can feel pretty intimidating. How much stuff do you need to buy? How can you possibly learn all the rules before you start? How long does it take to plan a campaign? Do you need maps and mini-figures? As this guide may very well be your first entry point to the world of Dungeons & Dragons, let me take this opportunity to give you the single most important piece of advice. No matter what else you learn and add to your personal philosophy, this is the foundation: There is no wrong way to play D&D as long as everyone is having fun. The rules are more like guidelines, than actual "rules." There is no wrong way to play D&D as long as everyone is having fun. With that said, what follows is a high-level outline on the next steps. It isn't exhaustive, but it doesn't need to be. Let's ease you in here. Generally speaking, the ideal party size is 3 to 5 people (plus you, the DM). Close friends work best, but strangers will do in a pinch. Enemies are a last resort. As you start exploring the books and pre-built campaigns, you'll find that this party size is the benchmark for difficulty, leveling, and rewards. By all means, you can certainly play with more or less people, just know that it will result in more work for you, and most likely less fun for the players. If you think about it, Stranger Things is real world D&D. Parties of less than 4 are more prone to player kills (PKs) and larger parties inevitably take longer to play, resulting in bored players waiting to matter, sitting on their iPhones. If you've ever watched streaming D&D, you usually see these large parties of smooth, patient, and highly collaborative characters. These players are actors. They're there to entertain you, and they're making money doing it. Your game will usually not run like these, and that's okay. What makes it great is that it's yours. Just so you know, there is a way to play D&D with huge groups. It's called the West Marches style. It's pretty neat actually, but let's not get ahead of ourselves. Let's keep it simple. Long story short, just stick to the classic party of four if you can. Long story short, just stick to the classic party of four if you can. There are too many sad threads on Reddit about DMs sitting alone in empty rooms with hot pizzas, cold beer, and no one to share it with. It can also be hard to get momentum going if someone’s always missing and you’re postponing either the game or the exciting storyline bits. Nothing takes the joy out of your hard planning and preparation like a group that doesn't show up. Make sure they're in. One way to be sure they're "all in" might be to require a small buy-in. $25-$50 per player, which will go towards covering books, dice, materials, etc. If you’re feeling generous, use the money to buy them each a copy of the Player’s Handbook — and if they’re a spellcasting class, a deck of their Spellcards. You’ll save a ton of table time and everything will go smoother all around. Trust me. It's up to you, the DM, the set what races and classes the players can pick from. If this is your first time behind the DM screen, I highly recommend avoiding homebrew classes and variants. As long as your players pick from the official material, the Players Handbook and any of the supplements (like Xanathar's Guide to Everything), you'll be fine. D&D 5th Edition is very balanced and hard to "break". Wizards of the Coast have done a phenomenal job with that. It's plug-and-play. 5th Edition is designed so you don't need a healer in your party to survive. Characters can heal themselves during short rest by spending "hit dice". These dice are renewed at long rests, and as you level up you get more of them. This gives your players a lot more flexibility in how they compose the party. Which classes are easier to play? How to choose your character class. Flowchart: Which class should you play? If nobody wants to be "stuck" as the Cleric, nobody has to. You can have a party full of Rogues running a thieves guild or a merry band of Bards singing and strumming their way annoyingly across the land. While it may result in less variety in the party's collective abilities — the role playing aspect could be very interesting. That being said, Clerics are badass. They're plate-wearing, spellcasting, group healing, shield toting, hammer swinging, holy tanks of fury. Why wouldn't you want to be a cleric? Get your schedule planned out before you start. I recommend starting with a weekly 2-3 hour block. Bi-weekly works pretty well too, but I found it’s much easier to plan for every week and have to bump than plan for ever two and end up not playing for a month. It really kills momentum, and the fun. If you don't plan on doing a heavy story-driven campaign and just want to kill some bad guys and find the loot, you can try meeting once a month on a Saturday and playing one-shot adventures with whoever comes. Have some pre-built characters in case they forget theirs or bring a friend. Tip: Ask your players to rotate bringing snacks and drinks. You're the DM, you're doing the most work, you should get a free ride in this department. Let's start with the essentials: books, dice, and a few office supplies. We'll save the fancy stuff for another day. You can run infinite campaigns for years with nothing but these 3 books. Whether you choose hardcover or digital is totally up to you. I prefer the hardcover books because I can slap sticky tabs all over the place for quick reference and they look awesome on my bookshelf. Going digital is cool because you can search, bookmark, and have access anywhere you. Your call, your style. These 3 books combined on Amazon will run about $95. It's reasonable to ask your friends to pitch in and split the cost. After all, you're going to be doing all the planning and prep work while they get to roll in a few minutes late and jump right into combat. If you want to go digital, checkout DND Beyond, the official source for digital rulebooks and adventure modules. You'll need to sign in with Twitch to even realize you can buy the material this way, but once you do, you'll also unlock a bunch of killer tools to go along with your content. You can worry about the rest of the books later as you need them. We can help you decide if and when the time is right to expand the library. If you're itching for just one more book to spice things up, I'd recommend Xanathar's Guide to Everything. It's an expansion to the Dungon Master's Guide and includes new spells, subclasses, magic items, backgrounds, and a bunch of other cool stuff. I quite like the "Common Magical Items" - a list of whimsical loot that doesn't affect combat, but rather provides fun role playing opportunities. Like the Cloak of Billowing. It just billows on command, making you look awesome. Or the Wand of Smiles. It makes people smile whether they like it or not. That's it. Time for the funky dice with all different sides. There are whole sites dedicated to reviewing the vast hoards of dice sets out there. You can spend hundreds on solid metal dwarven-style dice if you want. But you're just getting started, and dice probably isn't the best place to spend your money. You're likely going to be rolling behind a screen anyway, fudging a roll here and there. They don't need to be fancy. 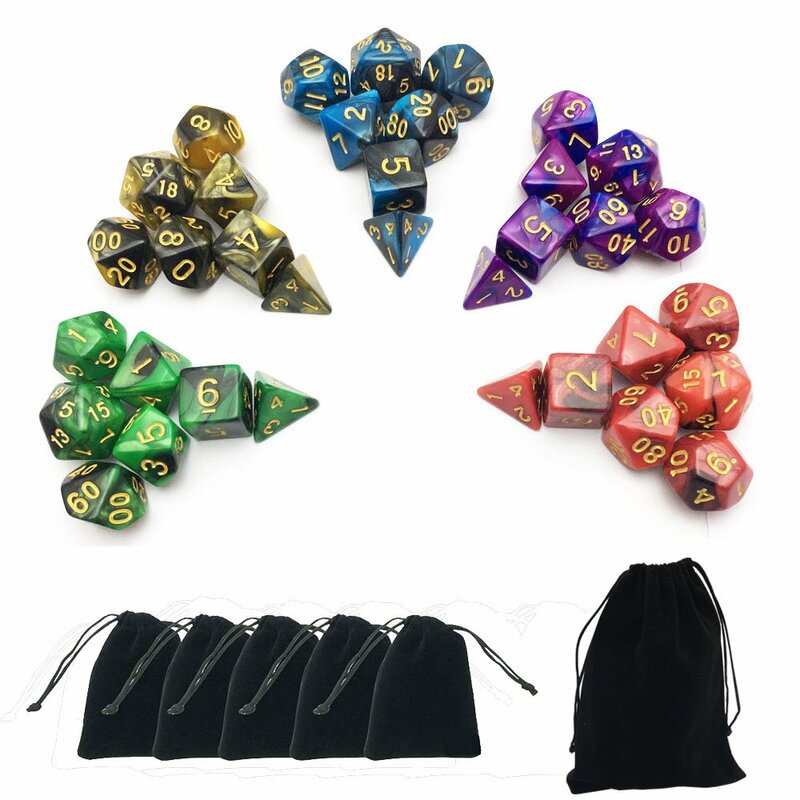 For $10 you can get a pack of five 7-dice-sets (d4, d6, d8, two d10s, d12, d20) each in their own little pouch. 4 sets for your players and one for you. Perfect. Done. Totally optional of course, but most people want a cool looking screen to hide their notes, books, and whatnot. Your side of the screen is covered with quick reference information that you can keep handy. The official Dungeon Master's Screen runs about $10. No problem. Keep it really simple and grab the D&D Starter Set for $15 and use Roll20.net to look up monster stats. The Starter Set strips out a lot of really good content from the Dungeon Master's Guide (like how to fill out character sheets, handle leveling up, only has a few classes and races, etc), but is good enough to get the adventure moving and you can use the internet to fill in the gaps. If you're not sure your friends are going to love D&D (don't worry, they will), just start here. Plus, it comes with one of the best starter adventures, The Lost Mine of Phandelver. Honestly, it's worth buying just for the adventure. It's by far the most loved level 1-5 adventure in the D&D universe. At this point you have a party, books, dice, ideas, and can't wait to get started. But how exactly do you turn those rules and lists of item and monster stats into a game? That's where the prebuilt adventure modules come in. They'll contain plot hooks, quests, bad guys, encounters, NPCs, items, treasure, secrets, tavern rumors – you name it, you'll find it in adventure. Wizards of the Coast has quite a few official adventures, but they aren't all equal. Each adventure has a very different focus and is a different play style. I highly recommend starting with the D&D Starter Kit’s adventure, The Lost Mine of Phandelver (LMOP). It’s a perfect introduction to the game. It starts simple and leaves plenty of room to hook into other adventures (including your own) later. It’s designed for a party of 3-5 players and will get them up to level 5 by its conclusion. It is very well organized, has fun mysteries and plot twists, some good villains, a quaint little town that that the party can feel at home in, a nice cast of NPCs, plenty of optional side-quest content, interesting encounters, and reasonably good exploration aspects. Quite frankly, it's as close to perfect as a prewritten adventures come. If you’ve listened to The Adventure Zone, you recognize the town of Phandalin - the McElroy brothers ran LMOP for about 5 episodes before branching off into Griffen’s fantastic homegrown campaign/story arcs. Check out our Guide to Running the Lost Mine of Phandelver to get some ideas on how to make it even better. If LMOP isn’t for you, maybe you want something different (or longer, perhaps) there are plenty of other options, but just a heads up - they're all a bit more work to run and require more time to really understand their big picture. The Curse of Strahd is vampire themed, Tomb of Annihilation is a meat-grinder set in a jungle full of undead dinosaurs, Out of the Abyss starts the players captured by dark elves in the Underdark while demons battle for the world, and you should stay away from Storm King's Thunder because its sandbox style campaign is very, very hard for new DMs (or any DM to be honest) to run effectively without getting lost. If you want to kick it old school, check out Tales from the Yawning Portal, a compilation of the most classic dungeons over the last 40 years of D&D, updated for 5th edition. But honestly, you should probably just go with LMOP unless some of your players have done it before. Go with Lost Mines of Phandelver unless some of your players have done it before. The Session Zero is a special session with your players. You spend time working on character creation, explaining core rules, answering questions, and covering player backstories. It's an opportunity to explain to your players how you want to run the game, and get their input on what they want out of it. Lay down the ground rules. If you’re going to change some of the core rules (it’s totally cool, even encouraged to do that), lay those down up front. There are some awesome variations out there, like Darker Dungeons, that add some really interesting mechanics. As you explore this site, and those resources, get a little list going, and then run through it with your players. Also, decide on how you plan to handle “on the fly rulings”. You can fix it now, or fix it next time. In other words, if you don’t know a rule and you don’t want to look it up (try not to, it’s a momentum killer), just decide how you want to play it out and keep going. If and when you realize there’s a better/different way to address it, you can put that rule into play immediately, or in your next session. A good rule of thumb for on-the-fly rulings is to just make the action in question have advantage or disadvantage. Not sure how to adjust stats for shooting a crossbow over your shoulder through a window at a moving target using a mirror? Sounds like disadvantage to me. You can have your players build their character sheets ahead of time, or you can do them all together. I kind of like having an interactive, non-gameplay session zero where you all just work through your characters. Get those stats together, decide on some backstory elements, figure out which “dungeoneers pack” you’re going with. Establish your phone policy up front. Trust me, it's a lot less awkward to get ahead of this one than to have to talk to that one guy. I prefer no phones. It means players can't be looking things up online on Roll20 (bummer) but you always worry less about the nitty gritty details and stay "in the game" better. Give your casters a component pouch. It carries all the various oddities a magic user needs to cast their basic spells. Anything that isn’t a rare/expensive item, like a diamond or pearl. Nothing is more boring than having your druid wander around in the woods, rolling dice to find phosphorescent moss. Nothing. Have them each come up with a "hook" from their backstory. It can be anything, and as simple as they'd like. "Brolin has a fear of spiders because of childhood incident." or "Maz likes carving sailboats in his freetime." Each of these little facts gives you a chance to weave situations into the story that affect them personally, and provide role-play opportunities. You better be sure Brolin is going to run across some nasty spiders, and perhaps Maz is more equipped to handle a puzzle situation where a stone object is broken and he can craft one out of wood. That kind of thing. Just store these little hooks somewhere. We'll get into tips on organizing your campaign later. If you're working through a pre-built campaign, I generally recommend reading the entire book end to end before you get started. That's not a big ask for LMOP, but if you plan to run Storm King's Thunder, Out of the Abyss, or another 300 page adventure, it's a decent under taking. Feel free to skim along but make an outline of the key themes and villains early on so you can start to foreshadow details. How do you prep your sessions? If you're home-brewing your own campaign, you're gonna want to check out our upcoming guide on just that. In the mean time, check out Sly Flourish's "Lazy DM" series and book. Make some notes on 3x5 cards (or note taking app, or whatever you feel comfortable with). Compile the monsters you're pretty sure the party will encounter, sketch out the combat strategies for the various mobs (The Monster's Know is an amazing resource for monster tactics), list your key NPCs and a few details about each. Assemble a few facts/clues/secrets/quests you plan to the party to encounter. As your campaign progresses, update each NPC card and note what they've been up to since the players have seen them last. If your players have skipped something important or fun you've worked up, just repurpose it elsewhere. Your NPCs can be pretty interchangeable - that quest doesn't have to come from the militia captain, perhaps there's a rich noble nearby, a mysterious stranger in a tavern, or farmer on the road that will serve the purpose just fine. Keep it simple, don't over-prepare, and improve the rest. There are a lot of ways to play D&D. If you’ve spent any time watching the “pros” stream D&D (like Critical Role, Dice Camera Action, and others), or listened to podcasts (like The Adventure Zone), you’ve got one idea of what Dungeons & Dragons is. Your friends might have another. Talk it out with them. What are they excited for? Dungeon crawling? Loot gathering? Role playing? Tactical vs "Theater of the Mind"
Every group is unique. My players love a mix of tactical combat and narrative, "Theater of the Mind" encounters. Because of that, I'll run more important combat sequences on a gridded dry erase mat with miniatures, and the more simple ones narratively. For example, if they're in a 30'x30' square room with 2 orcs and 2 goblins, we don't need to see it. Everyone is in reach of each other, and the party is probably blocking the only way in and out. But put then in a massive cavern with elevated rope walk ways, trap doors, ballistas on mounted towers, and a small army of sneaking, evasive goblin archers? Yeah, let's get organized. You do not need to spend a fortune to make tactical grid combat work. The simplest method is to buy a dry erase game mat and use whatever you've got around the house as markers. Chess pieces, legos, small action figures and toys, it doesn't matter too much. If you want to put a little time in, there are some awesome Papercraft minis you can get into. Print off a bunch of these mobs, tent them up and you're good to go. And then of course, there are the minis. Miniature Market is a great place to find things at a decent price, as is eBay. And if money isn't an issue, it doesn't get more badass than Dwarven Forge. Except for this. While you simply cannot make everybody happy all the time, you can definitely take into account the overall preferences of your players and design a campaign to excite and engage everyone. Try to mix these three pillars evenly into your campaign. When the players are happy, you (the DM) are happy. You are rewarded for your efforts with their excitement. It’s a very unique sense of accomplishment I hope everyone has a chance to experience. The best feeling I've ever had DMing a campaign was when my players asked if we could meet again next week instead of our regularly scheduled every-other-week pattern. The little things matter.